It's always crucial to keep our priorities in order. Even a person who's getting married in less than three weeks needs to keep working on the quintessential brownie recipe. What a revelation it can be, then, to discover that the recipe was actually within easy reach all along. And what an analogy for life-altering events: sometimes what we most want is within our grasp, if only we can see it, find it, take hold of it. When I was a child, I was fond of the many children's books by British author Noel Streatfeild, which fed my fantasies of a) being British, so that I could eat trifle and have "cream teas", whatever they were, and b) being an orphan who would end up at a professional children's school, to be trained for a "useful" profession -- like the stage, of course. In particular, I loved Ms. Streatfeild's first book Ballet Shoes, where the orphans seem to constantly be preparing for the Christmas pantomimes. A production that figured largely in these preparations was Maurice Maeterlinck's "The Blue Bird," in which two children set out on travels and adventures to find the Blue Bird of Happiness -- only to discover, at the end, that it was in their own back yard all the time. It's a sort of "no place like home" allegory, which is a good one to dwell upon, I think, as I plight my troth (whatever the hell that means). I mention all this because I finally rediscovered the brownies of my dreams right in my own back yard -- or in my own kitchen, as it were. Over the past several years, I've made many batches of brownies, searching for that apotheosis of deep chocolatiness combined with true chewiness. Chewiness should not be mistaken for fudginess. Fudginess, in my opinion, is easy to achieve, especially if you undercook your brownies a bit, and then stick them in the fridge. But chewiness is when you create a bar cookie that has almost the toothiness and snap-back of a caramel. I tried recipes with corn syrup (eeekk), substituting molasses or honey or sometimes golden syrup. I tried using various blends of sugars. Many of these recipes were good, as were their resulting treats -- and often popular with the populace upon whom they were bestowed. But for me, they were missing something. So I tried a tiny psychological exercise on myself. When had I had brownies like the ones I was thinking of; what were the ones that had the qualities I wished for? There was only one right answer. I searched inside the battered sheaf of old newspaper clippings and back-of-envelope scrawls until I came upon the two bits of paper. There was an ancient insert from an ancient box of Droste's cocoa, with modifications jotted next to the quantities. And on the back of an envelope, there was a further metamorphosis of the same recipe, with the words "Ellie's Brownies" at the top. Ellie was my mother's name -- and the name that will be given to my niece-to-be, as she and my nephew-to-be dive into the world, later this spring or early summer. My mother's brownies. Of course I didn't really want to be an orphan. Over the years, she refashioned them from the modest version on the little insert in the Droste's box. Bit by bit, she upped the cocoa content until they were deep, dark brownie wonders. She kept the butter content low, and added a bit more brown sugar, which gave them the extra chew factor. And she perfumed them with orange -- grated rind, a squeeze of juice, a splash of Grand Marnier. When they were good, they were wonderful -- perfect, in fact. Occasionally she became distracted, and overbaked them, in which case they still tasted chocolatey but were beginning to move over to the crunchy side. A few times, in an effort to give them more of the citrus perfume she loved, she put a bit too much orange juice and Grand Marnier in them, and they turned cakey. But most of the time they were lovely. In addition to their delectable chocolatey chew, these brownies are actually not nearly as deadly as many other versions you might set your teeth to. Firstly, they're made with cocoa rather than chocolate. Secondly, for an entire 13 x 9 inch pan, they require but one-half cup of butter. Consider, by contrast, Nigella's Domestic Goddess brownie recipe, which has 13 ounces of chocolate and one and 2/3 cups of butter. Or the Barefoot Contessa, whose Outrageous Brownies call for a pound of butter and over two pounds of chocolate. I also think these particular brownies are a perfect vehicle for lots of crunchy walnuts, a protein/fiber/omega 3-laden superfood. But don't make these for their health benefits. Make them because they are really and truly good. I'm really not much for stinting on ingredients when it comes to dessert. I make these because they actually satisfy my brownie jones better than the richer kinds. My best beloved G prefers them nutless, of course, and without orange -- pumped up instead with a handful of Ghiradelli or other good bittersweet chips. It's easy enough to make a batch of batter, scoop half into one side of the pan and pat it down with a smattering of chips. The other half gets the walnuts and the orange elements, and so we're both happy, eating brownies together. A good metaphor, I think, for how to conduct a marriage. Sometimes a recipe is more than a recipe; the act of rediscovery is a reminder of the absolute love that's right here at home, after what feels like a lifetime of searching the wide world over. I've upped the cocoa in these even more, to good purpose, and given the brownies a nice salt kick. The orange elements are certainly optional, but quite delicious. The layer of batter is a bit thinner in the pan than what you may be used to, but this also ups the "chew" factor. Preheat the oven to 325F. Line the outside of a 9 x 13 inch baking pan with aluminum foil, and press it to the shape of the pan. Carefully remove the shaped foil, and fit it down into the inside of the pan. Butter the foil very well. This promotes easy removal of the brownies (a trick learned from Maida Heatter, to give credit where it's due). Melt the butter in a large saucepan -- big enough to mix the brownie batter in, so you can have a one-pot recipe. Mix in the sugar till well-blended, and then the eggs. Stir in the vanilla and the salt. Mix in the cocoa, and then grate the orange rind directly over the batter. Cut the orange in half, and squeeze the juice of one half into the batter, being sure to pick out all the pips that fall in. Save the other half to slurp at while the brownies are baking. Lightly stir in the flour, and then the walnuts. Don't be alarmed if the batter is quite thick, more like a dough. Pat the batter/dough evenly into the foil-lined, buttered pan. Bake for approximately 30 minutes, but start testing at about 25 minutes. Take them out when they're no longer wet, but there's still a bit of fudgy crumb clinging to an inserted toothpick. Cool in the pan ten minutes or so, and then lift them out, foil and all. Cool to room temperature before cutting. They cut more easily if they're refrigerated for a few hours first, but this depends on your degree of restraint. I like to cut them small, so that I can justify having another one. The brownies from the edges are always a bit crunchier and chewier -- my preference. Some people like the softer middle pieces best. Keep in the refrigerator for up to five days, or freeze -- they taste pretty divine straight out of the freezer, too. This was such an enjoyable post. Really, a great story, like one of the best I've ever read! Thank you! Mmm, looks tasty. 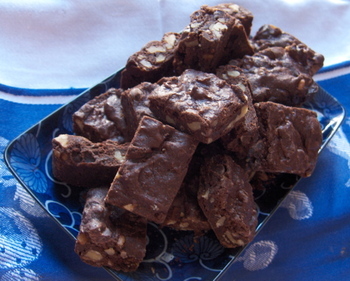 I really like Alice Medrich's low-fat brownies because they are really chewy. I'll have to try yours. The best brownies I ever had was from my brother's friend's mom. She was a caterer. They were deeply dark, really chewy, yet soft and delicate. I'll have to try yours. What a perfect brownie marriage! Very tempting the butter content being fairly low! I like that. What is it about husbands (or husbands-to-be) not liking walnuts in their brownies? I have to do the same thing to brownies-half with nuts, half with chips. Interestingly enough, our son (named Ellis-goes by the nickname of Ellie T occasionally) picks out both the nuts and the chips to eat separately as a side dish to his brownie extravaganza. I will have to try your recipe if only b/c of the name. I'm glad you found your brownie center (that sounds oddly like an candy bar advertisement but I like the ring of it). Is it really only 3 weeks away? Whew. She is hosting a browniebabe event this month! Junglegirl -- thanks so much for the compliment, and so glad you enjoyed the story! If you make the brownies, you'll enjoy them too. Ummm..Jessica? Do you by any chance have your brother's friend's Mom's recipe? I'm always up for trying something new...but do try these. They really hit that chocolate-chew spot. Tanna, you'll never notice the lowered fat in these, or at least I never do -- and I usually HATE low-fat stuff. Hmmm...perfect "brownie" marriage, eh? The stuff of which compromises and good marriages are made, no? Oh Sucar, time is creeping up on me. Yes, it's mere weeks away, and we're looking forward to having the weeks of wedding madness over so that the peaceful restful content marriage can begin! Janelle, thanks so much for calling this to my attention. If I can make it happen, I will. I love the way you write and particularly enjoyed Taste Of The Past. I always suspected that I may be a man as I hate nuts in my brownies too! This recipe looks dangerously addictive. Hi Julie, I don't think I can track down that recipe. :-( I had those brownies when I was 11 (hmm, that's 14 years ago). My brother drifted away from that friend several years ago. Err, I could ask my brother if he has any leads, but I doubt it. Bana, I'm so glad you liked these. They are my absolute favorites too. Julie, I just made these, and, WOW. These are QUITE something. Most chocolate desserts, much as I enjoy them, taste primarily of sugar and then of chocolate, if that makes sense. I'm constantly looking for a way to lessen that insipid sugary top note, heighten the chocolate, bring it into the forefront so the taste on your tongue is almost..aggressively.. chocolaty. "This is a really...*black* chocolate flavor," said my friend this evening. (I didn't use the orange elements, added chopped bittersweet chocolate as had no bittersweet chocolate chips). Point is, well done. Here's the question: The gooey-sticky batter, almost a caramel consistency (you're right about the toothy snap-back effect, and the sea salt is gorgeous here), was REALLY thin in the 13x9 inch pan and after the brownies were cool, they seemed to get a bit dry sitting around. Have you tried baking in a deeper pan? I may have used too much chopped up chocolate, which might have added to the dryness--there was a bit of moisture needed. Anyway, totally scrumptious. will make again. A recipe that will stay with me. Rachel, I'm so glad you enjoyed these. I find that they're about 3/4 inch thick in a 9x13 pan -- I think the thinness contributes to the chewiness factor. Mine don't seem to get dry -- I wonder if you're overbaking them a bit. Certainly if you want to try them thicker, you could go for a 9x9 inch pan and see how that works. I thought I hated chocolate and orange together but figured I would be true to your recipe in the spirit of adventure. I was wrong. I impulsively made these last night with a combo of brown and white sugar with glug of molasses. (I ran out of brown sugar!) And the chocolate chips because I had no nuts on hand. And they are wonderful! They stuck to the foil something awful, but the effort of extricating them was well worth it. I will definitely be making them again. Melissa -- can't figure out why they stuck to the foil -- that's never happened to me. Maybe the molasses made them super-sticky? In any case, I'm so glad you liked them. oh, in case no one explained, "plight" is pledge and "troth" is truth. So you pledge your truth to your spouse. Kinda nice. These sound like awesome brownies. So I tried again and I followed the recipe. They did not stick to the foil at all and were again received (by a new group of tasters) incredibly well. However, next time, I am intentionally using molasses regardless of my brown sugar situation and in spite of the stickiness! The serendipitously molasses-tinged ones were darker and even more chewy, and I think I preferred them. Either way, thanks again for a fabulous (and fabulously easy) recipe. Melissa -- excellent that this recipe is workin' for ya, as they say. Tell me what your molasses/sugar proportions/ratios/measurements are -- I'd love to try the recipe your way. Hmm... Well, I was totally out of supplies. So I used all my brown sugar (almost exactly one cup). And then I dumped all of my remaining white sugar into a 1-cup measure. It filled it probably a bit more than 3/4. Then I filled to the brim with molasses. Somewhere between 3 and 4 tablespoons of molasses? I apologize for being so unhelpful! I was just winging it since I really wanted to make brownies but didn't have time or motivation to go to the store. About that much, though, and I think it was definitely different. Sounds great, Melissa. I'm definitely going to give it a try. Don't you envy the freedom of birds, that they can fly without mechanical assistance? And no ticket needed! keep posting such a nice post.